New pictures from the Mars rover Curiosity include the first panoramic view of the Red Planet. NBC's Brian Williams reports. The first pictures from the best cameras on NASA's Curiosity rover document a Martian landscape so Earthlike it reminds scientists of home. "The first impression that you get is how Earthlike this seems, looking at that landscape," said Caltech's John Grotzinger, chief scientist for the $2.5 billion mission. "You would really be forgiven for thinking that NASA was trying to pull a fast one on you, and we actually put a rover out in the Mojave Desert and took a picture." California's Mojave Desert is less than 100 miles away from NASA's Jet Propulsion Laboratory in Pasadena, where Grotzinger and his colleagues are poring over each batch of images sent back by the car-sized rover. Mission manager Jennifer Trosper said 100 megabytes of data had been received from Curiosity as of today, and that figure is sure to grow rapidly once the spacecraft's high-gain antenna gets up to speed. The day's biggest milestone was the raising of the rover's 3.6-foot-tall (1.1-meter-tall) camera mast on Curiosity's deck, which provides a vantage point 7 feet (2.1 meters) above the Martian surface. The mast houses Curiosity's high-resolution navigation camera system, also known as Navcam, as well as the two-camera Mastcam imaging system — and a laser-zapping rock analysis experiment known as ChemCam. Curiosity rover scientists Justin Maki, John Grotzinger and Michael Malin discuss Martian imagery showing a Mojave-like scene on Wednesday. 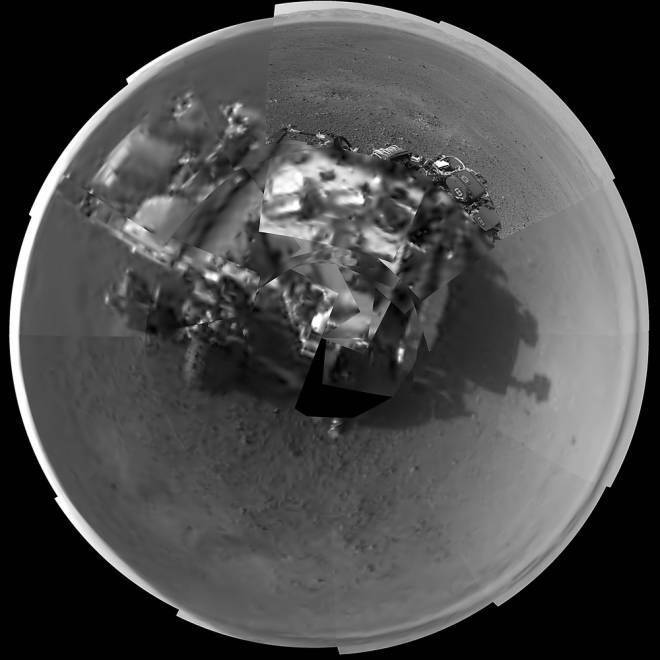 This Picassoesque self-portrait of NASA's Curiosity rover is based on images taken by the navigation cameras on the rover's mast. The camera snapped pictures all the way around the rover while pointing down at the rover deck, up and straight ahead. Those images are shown here in a polar projection. The first image taken by the navigation cameras on NASA's Curiosity rover shows the shadow of the rover's now-upright mast in the center, and the arm's shadow at left. The arm itself can be seen in the foreground. The position of the shadow helps confirm the sun's location. The rover's name and a simplified smartphone tag are emblazoned on a piece of hardware in the foreground. 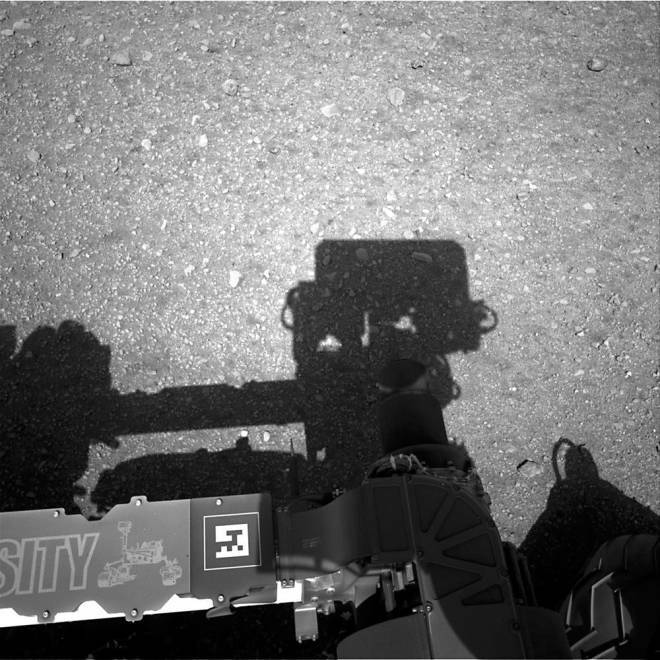 One Navcam image shows the shadow of the mast against the gravelly ground surrounding the rover, with pieces of hardware in the foreground. The picture includes a pixelated rover logo that JPL plans to incorporate into an augmented-reality "Virtual Rover" smartphone app. "Right now, [the logo] does not link to anything, as we will be working with it as Curiosity begins exploring," Michelle Viotti, Mars public engagement manager at JPL, said in an email. "It's a way to increase immersion for public audiences following the mission through 3-D modeling and other techniques — bringing supplemental info into a real environment in a way that's interactive." Another black-and-white image documents Curiosity's environment at Gale Crater: There's an intriguing trench that was apparently scoured out during the rover's descent, just a few yards (meters) away; and there are what appear to be imposing peaks at the crater rim, more than 12 miles (20 kilometers) away. Grotzinger said the trench could serve as a "freebie" for studying the Martian subsurface. "It's a bird in the hand right there," he said. When asked whether the blast of the thrusters on Curiosity's sky-crane descent stage might have exposed minerals worth analyzing, Grotzinger replied, "Sure, why not." Curiosity's prime mission is to study Martian rock and soil to find out whether the types of carbon compounds associated with organic processes might be present. Finding such compounds might lead scientists to conclude that the Red Planet was potentially habitable in ancient times, and provide pointers for future exploration. The big prize is a 3-mile-high (5-kilometer-high) mountain in the crater's interior, known as Aeolis Mons or Mount Sharp. The mountain's layers of rock are expected to document billions of years of Mars' geological history. Grotzinger and his colleagues say they may devote the first Earth year of the mission to studying the ground between the landing site and the mountain, roughly 7.5 miles (12 kilometers) away. Curiosity's primary mission is due to last almost two Earth years, or one complete Mars year, but scientists hope that the nuclear-powered rover will last much longer than that. Trosper said that the rover was in good shape, and that previously reported problems with Curiosity's REMS weather station have been cleared. "The instrument is completely healthy," she said. Another scientific instrument, known as the Radiation Assessment Detector or RAD, took its first measurements of cosmic rays and solar radiation on the Martian surface over the past day, said Don Hassler, a researcher at the Southwest Research Institute who's in charge of the RAD experiment. He noted that the measurements were made 100 years after Austrian physicist Victor Hess made the first observations of cosmic rays from Earth. "We've learned a lot in the last 100 years," Hassler said. The RAD instrument picked up multiple spikes of heavy-ion radiation that could be a concern for future human explorers, he said. 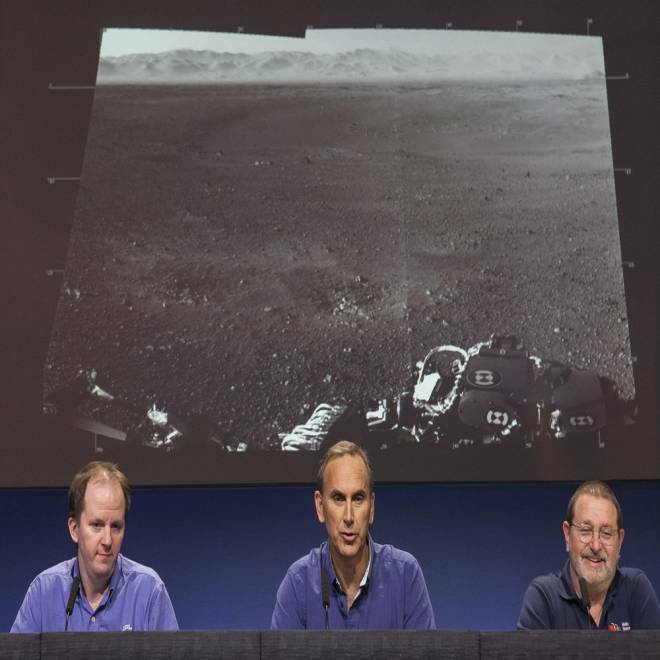 Michael Malin, a Curiosity team member as well as the head of San Diego-based Malin Space Science Systems, said that high-resolution color pictures taken by the rover during its descent on Sunday night were gradually being sent down to Earth. They'll soon be assembled into an animation with much more detail than the low-res version that was released earlier this week. Malin also showed off before-and-after imagery from NASA's Mars Reconnaissance Orbiter, pointing out six disturbed spots where tungsten ballast weights fell after they were discarded by the descending spacecraft. Previous imagery from MRO showed where Curiosity's parachute and backshell, as well as its heat shield and descent stage, hit the dirt. There are currently no plans to visit any of those sites, primarily because they're low-priority scientific targets. The six-wheeled rover is expected to take its first drive sometime during the next few weeks, depending on how the checkout goes. Trosper cleared up one question that has bedeviled the clock-watchers covering the mission: Exactly when did Curiosity touch down? The official time, she said, was 10:17:57 p.m. PT on Sunday (1:17:57 a.m. ET or 05:17:57 GMT Monday). When the 14 minutes of light-travel time between Mars and Earth are added in, that suggests that first word of the landing was received at 10:31 p.m. PT, which is in line with the schedule that NASA announced in advance. It took at least a few seconds more for Curiosity's fans, in JPL's mission control room and around the world, to react to the alert.